Each year educational alumni events are organized and count towards your designation's or association's CPD credits. The ACFI Fraud Conference would like to extend the early bird special to DIFA Alumni and Students who register by phone before March 17, 2017. If you are interested, please call the ACFI office at 416-226-3018. 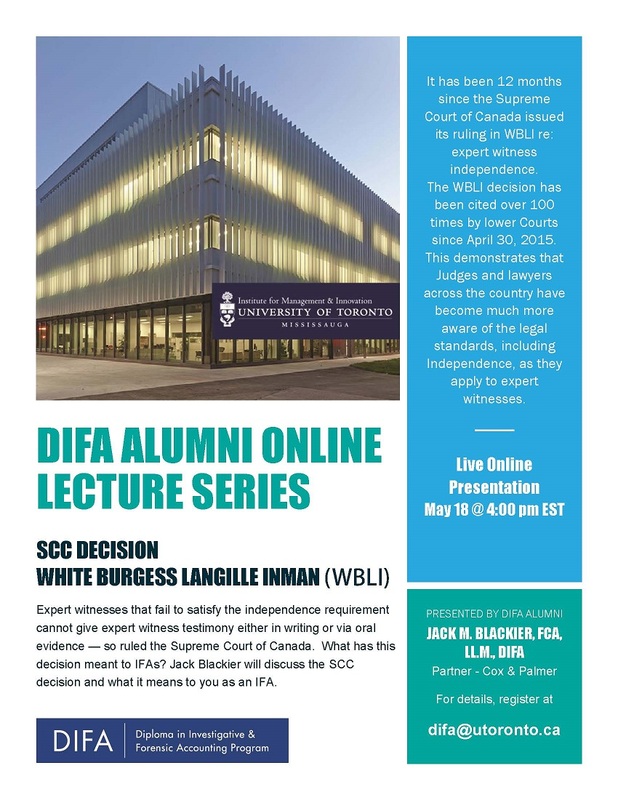 The DIFA Alumni group will be hosting an Alumni Dinner & Awards Night in the evening of May 1st at the event - more details under "Forensic Accounting in Transition - MFAcc Laundh, Dinner & DIFA Awards Night"
Understanding the Nortel Decision-Experts analyze: Why did the Nortel Prosecution fail? Forum Speakers: David B. Debenham, Co-Chair, Supreme Court of Canada Practice Group, Co-Chair, Fraud Law - McMillan LLP; Charles Smedmor, Managing Director - Smedmor & Associates; Nick Hodson, Retired Head of Ernst & Young's forensic practice. Jack M. Blackier is a DIFA graduate from Class 2009. Jack is a partner in the Saint John office of Cox & Palmer. He was called to the New Brunswick bar in 1997 after completing his education at the University of New Brunswick. Jack brings a wealth of knowledge to the Cox & Palmer team. Formerly of the firm Barry Spalding, he practises in the areas of tax, estate planning, commercial litigation, administrative law, and insurance law. Experts analyze: why did the Nortel Prosecution fail? 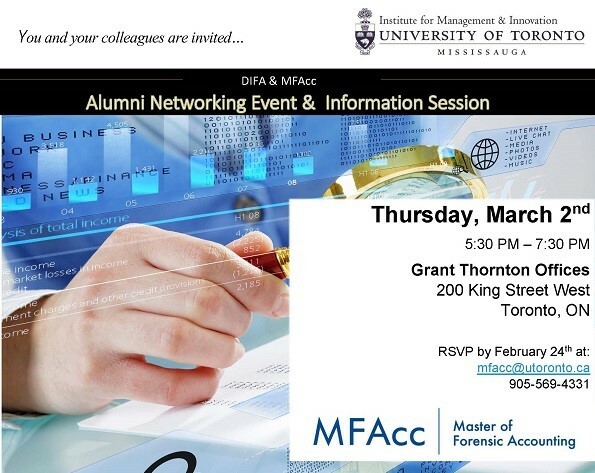 Toronto, ON (April 25, 2013) – The recent Nortel Networks verdict on alleged fraud was the topic of a candid forensic accounting forum hosted by the University of Toronto’s Diploma in Investigative & Forensic Accounting Program (DIFA). The forum attended by accounting professionals, lawyers, and regulators, and broadcast by webinar, featured commentary and analysis from three leading forensic accountants. The forum speakers were: David Debenham, a CMA and a partner at McMillan LLP of Ottawa; Nick Hodson, the retired head of Ernst & Young’s forensic practice; and Charles Smedmor of Smedmor & Associates. DIFA Director Len Books was the moderator. In answer to “why did the Nortel prosecution fail? the three experts presented their views as to why the prosecution failed to make its case in the six month trial. They provided input on why three former senior Nortel executives (Frank Dunn, Douglas Beatty and Michael Gollogly) were acquitted of all charges on misleading financial statements and alleged earnings management leading to the triggering of bonuses. David Debenham provided an overview of the decision. He also identified what the Prosecution had to prove beyond a reasonable doubt: there were materially false financial reports; and that the defendants fraudulently misled users. David noted that while materiality was a key issue at trial, the Crown did not have an expert witness on materiality. Further, David underlined that GAAP is subject to interpretation. For Nortel, he noted, the treatment of accounting issues was much discussed among executives, the Board, and the auditors, so the process was not concealed. This lack of concealment meant it was therefore difficult to conclude the defendants had an intention to act illegally. Nick Hodson emphasized that his views were his own, and not those of his former employer, and were based solely on his reading the court manuscript and the media reports. He provided a seasoned investigative and forensic accountant’s perspective. His comments focussed on the issue of materiality in this case, as well as the consideration that earnings management practices can be legal if immaterial. However, Nick asked, why executives strive to manage their companies’ earnings, if their impacts are truly not material. He closed by asking if additional evidence on materiality would have made a difference on the verdict.